So everyone made it there and Laszlo sent us a group photo of a killer sunset! 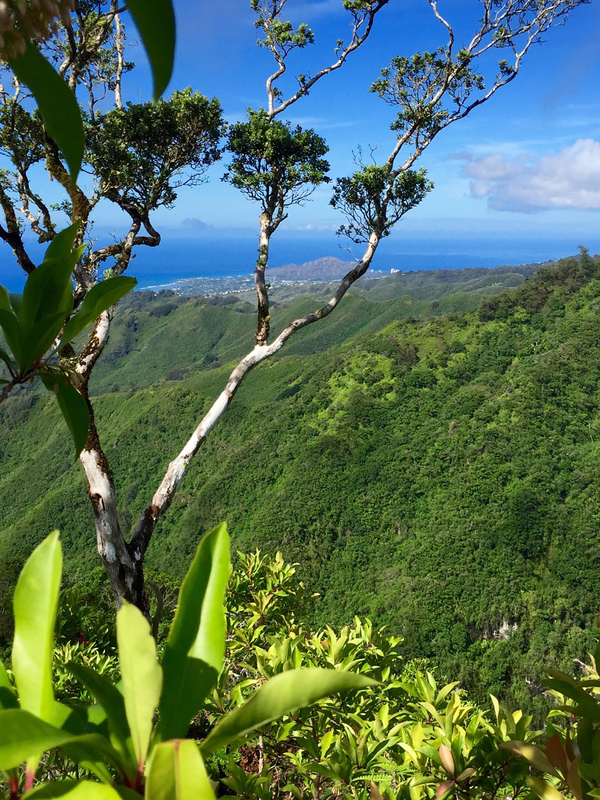 Hello, to our friends in Hawaii! Many of our AtBF friends are in Hawaii on a hiking excursion this week and someone has to hold down the fort! 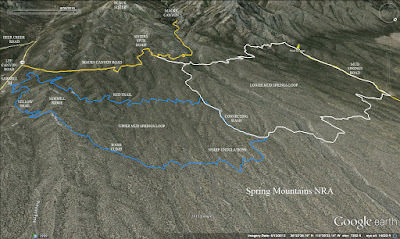 So five hikers came out for an 8.5 mile hike on the Mud Springs Loop starting at the Sawmill Trailhead off of Lee Canyon Road in the Spring Mountains NRA. 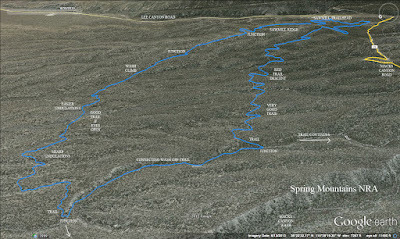 The entire Mud Springs Loop is approximately 17 miles long and it serves bikers and horse riders as well as hikers. 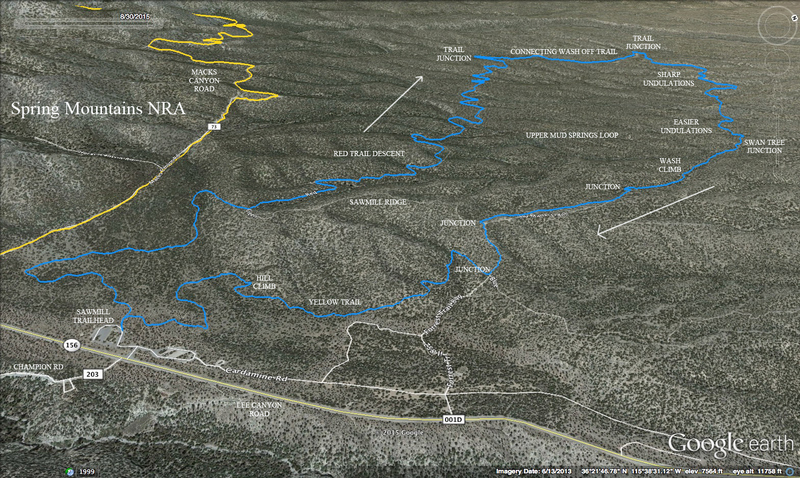 By cutting the large loop into two loops, it is more palatable for hikers. 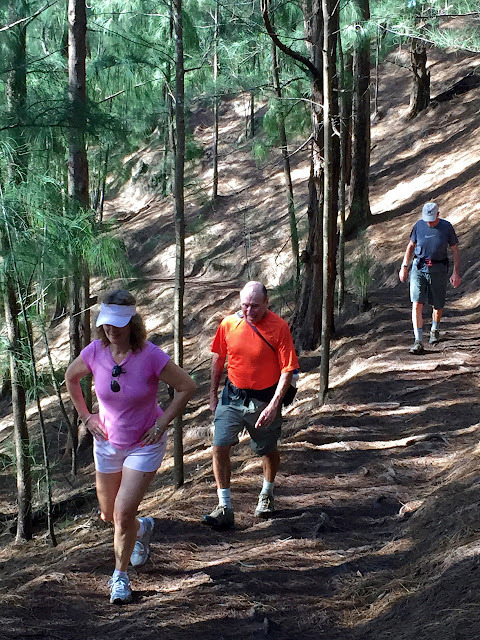 Today, we explored the upper half loop and enjoyed the challenging workout of ups and downs. 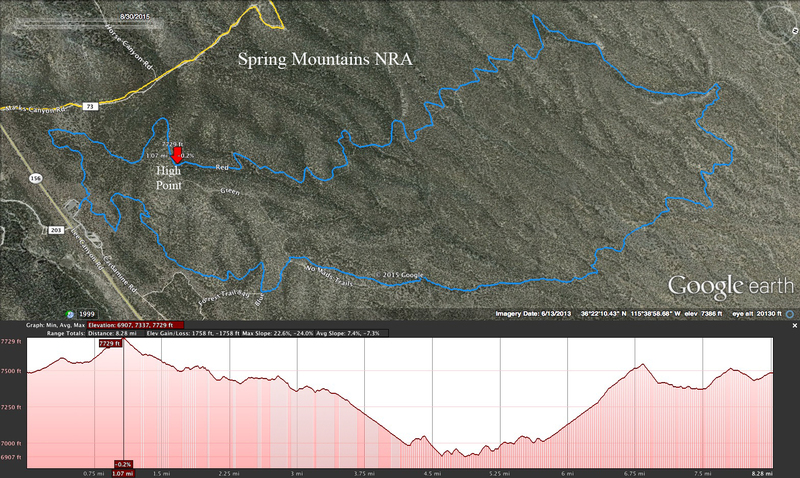 We began by climbing up to the ridge on the trail that circles around beneath Macks Canyon Road to the left. At the ridge, we turned left onto the Red Trail. A fast pleasant gentle descent ensued. We had hiked this part of today's route previously and sailed into the wash at the expected 3.5 mile mark. Here, new stuff began. We turned right instead of left in the wash for a 3/4 mile wash descent. We had to make our way around some initial brush but soon found the wash to be smooth packed sand with no obstacles. Looking out for expected landmarks (i.e. 3 washes entering in from the left side), we found the trail crossing for the north side of Mud Springs Loop. There is a medium size cairn placed out of the wash on the right side about twenty feet up the embankment. We sat here for our long break. The upcoming trail back to the cars would be mostly an ascent. Better to rest up! Starting out again found us climbing and dropping on short steep sections of trail as we crossed the drainages in the terrain. We had heard that this part of the loop is difficult to follow, however, we found that it was just a matter of keeping all 10 eyes open. We had to make choices only twice. We later found that either of our choices would have brought us to the same point. Granted, we were hiking up this section and not down, but, we did not have any problems. 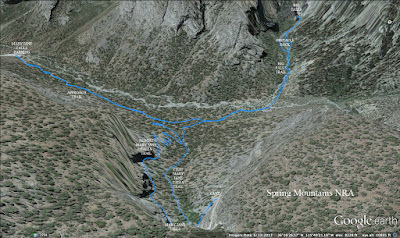 Sometimes hikers who are not from the western United States don't know to always consider that the trail might lead up or down a wash. This is something you get used to around here! 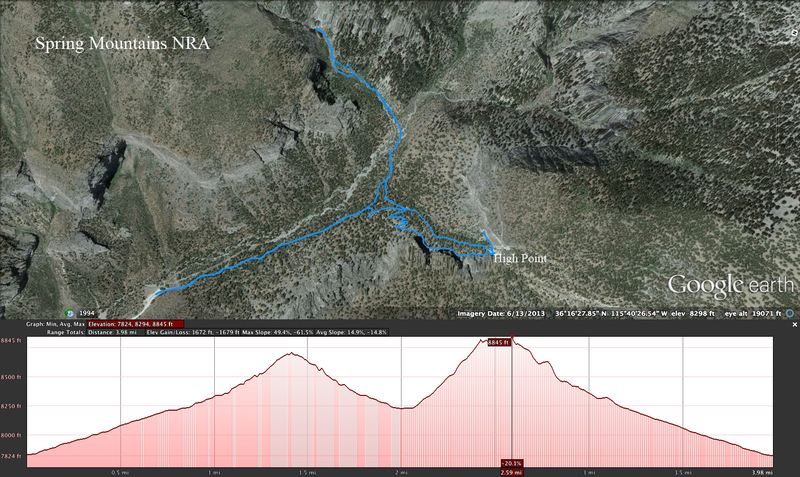 The trail in this section did, indeed, go into the wash for a short way a couple of times. As we crossed over one of the easier undulations, we couldn't help but notice the Swan Tree! Finally, we found ourselves in a long wash ascent. We were pleased that the ascent was gentle and the wash bottom was very hikable. At the top of the trail ascent, we curved around to our left and noticed the sign in the photo below. The words were imprinted but not painted on the very old signs. 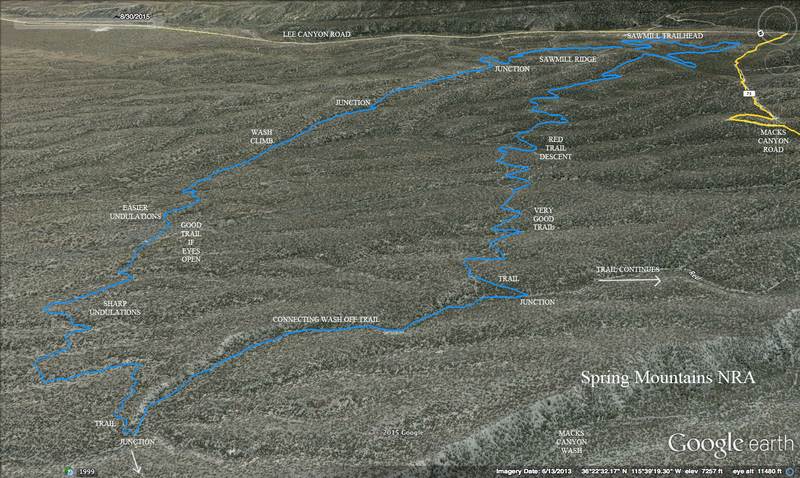 This curve sent us uphill to junction with the Pinion Pine Trail where we took another right. Further climbing brought us to the Sawmill Ridge. We turned to our left and dropped down the hill until we came to the Blue and Yellow Trail junctions. We turned to the right onto the Yellow Trail. Although we thought we were done with climbing, it wasn't so. 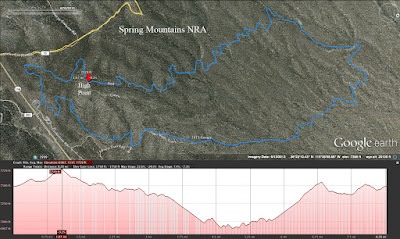 There was still one more mean climb before we were able to drop back down to the cars at the trailhead where hamburger smells were wafting from the many Sunday picnickers. Great workout with a swift pace. 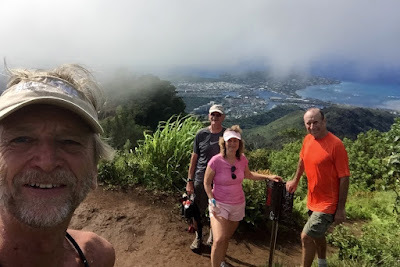 ...eastern most point on the Island, a pleasant stroll of 3 miles r.t., 700' elevation gain - with lovely views of Waimanalo, Bellows AirForce Base and Kaneohe Bay in the distance. Heading to Kauai mañana to meet up with Chris Dempsey and the rest of the gang!! 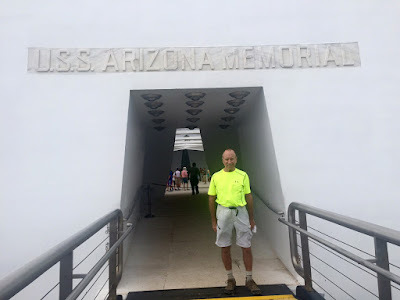 Aloha All: I'll add a short comment: Five sensational hikes in as many days, plus a Pearl Harbor tour. 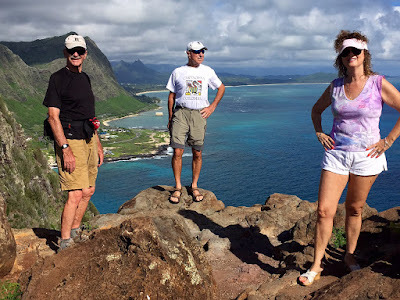 Lasz & Rozi were hosts extraordinaire, dragging Doyle & me all over the island of Oahu. 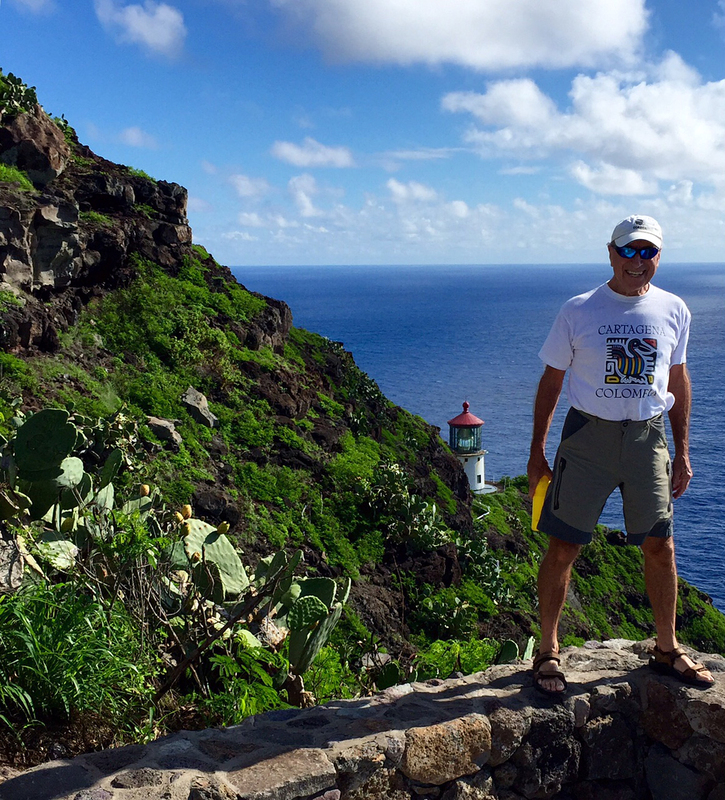 Just an outstanding week, and I believe we're going to tour the North Shore tomorrow. I'll need all next week in Kauai to relax! 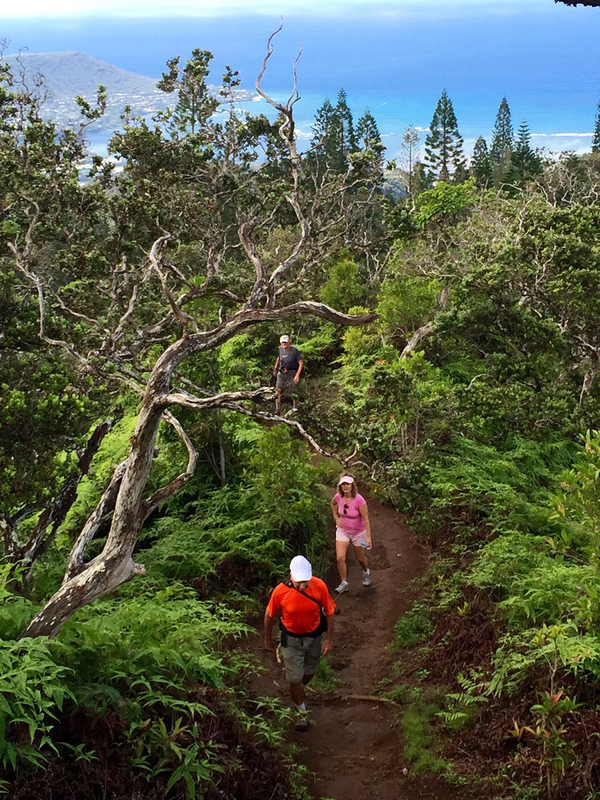 It was definitely the signature hike of the week. A demanding affair, fraught with peril. As we were descending the steep, slippery trail, a platoon of young Army soldiers was on their way to the summit. Thinking they were out of earshot, one GI casually quipped to his fellow soldier, "Damn, I hope I can still hike when I'm their age." Big smiles all around. Priceless. 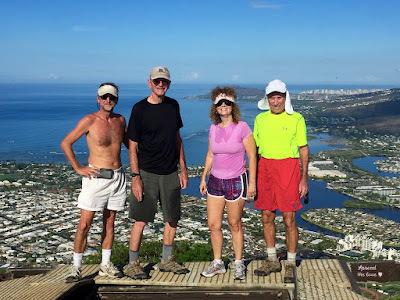 Pre-Hawaii Excursion 2015 - Koko Head Hike, aka, East Oahu StairMaster! 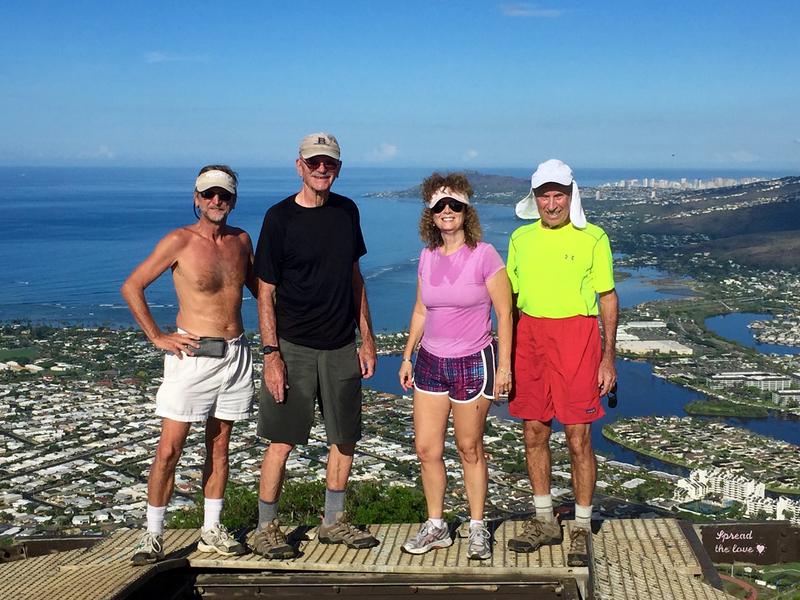 We did this great workout hike this morning - this crater is on the east side of Oahu, measures +1,100 feet in a distance of less than one mile! 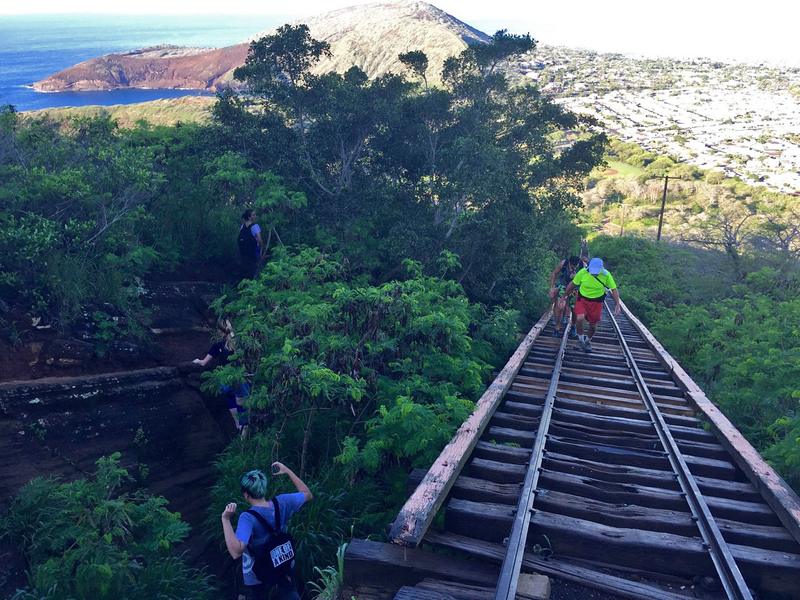 The pics depict the starting point of the 1,050 railroad tie steps, the deadly trellis over a small, bee-infested ( they were sleeping on the way up) cravass (sic), views along the way, the happy foursome a bit perspiry on the top and the midway point looking down and back up. Oh, what a beautiful mornin'! Sure, there was rain in the forecast but nine hikers showed up for this moderately paced hike in Kyle Canyon and several others showed up for a more difficult hike over in Lee Canyon. It's just water, right! 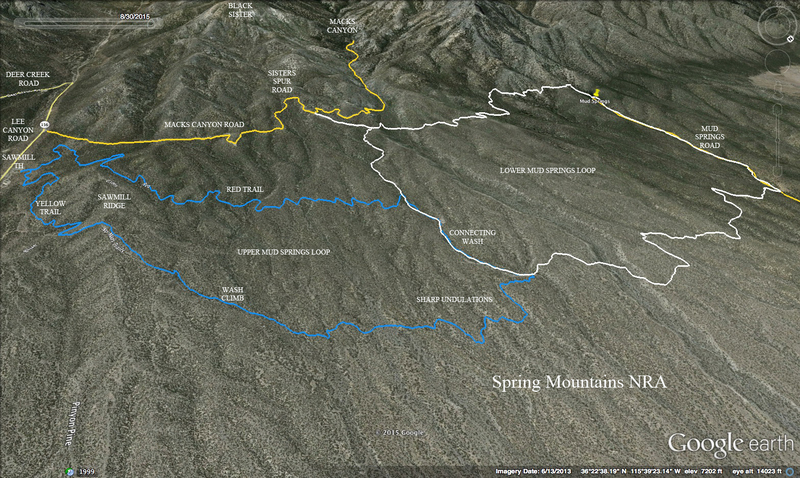 So, the nine hikers drove all the way up Kyle Canyon in the Spring Mountains NRA to the Mary Jane Falls Trailhead. The air was super fresh and the temperatures were perfect. So far, so good. We hiked up the mile of approach to the fork where the Mary Jane Falls trail turns into the trees on the right. After a short break, we stepped over the fallen tree and continued up a little ways and forked off to the left. After following the trail over to the wash, we started to drop down into the limestone gravel when we heard noises coming from the brush in the wash below. Three young mule deer bucks were foraging and sauntered away when we approached. Their antlers still had young fuzz on them. Soon after that, we saw one more as we started up the canyon wash.
To enter into the Big Falls Canyon wash, hikers need to stay near the left side wall here. So, we curved around that wall and headed up while being very careful of the slippery limestone on which we were climbing. Our pace was moderate as we methodically picked our way up through the rocks and fallen trees. About half way up, Obstacle Rock came into view where it is lodged in the crux of the narrows. 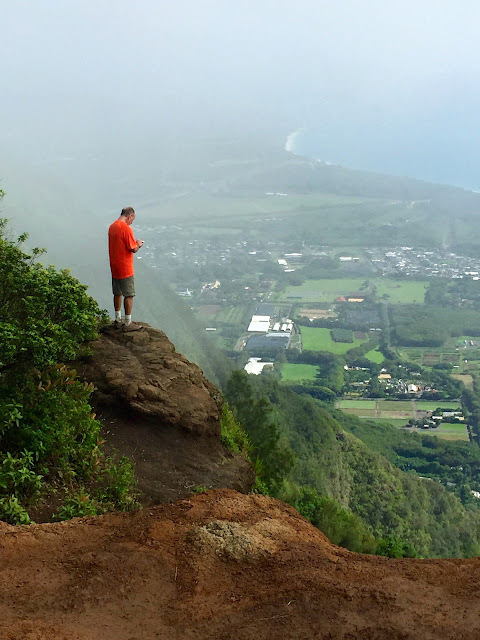 We found our "up and around" on the left side and carefully negotiated it on a slippery hillside. At the bottom on the other side, we got back into the wash as we scratched our way through the thistle and other sharp plants. By the way, someone has removed the rope ladder on Obstacle Rock as a measure of safety. 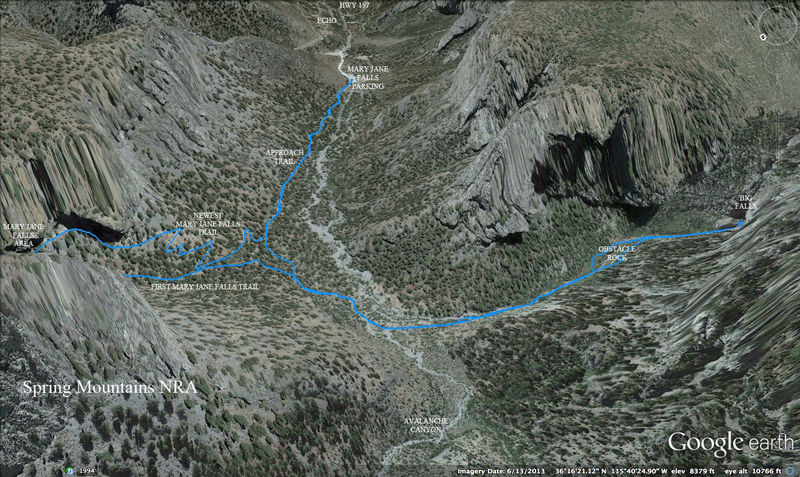 At the top of the canyon wash, we curved around to the left and saw the Big Falls alcove. During the snow melt season and, presumably, big rainstorms, Big Falls turns into a torrent of falling water and debris from approximately 90' to 100' above. Today, it was dry. Bone dry. And, we didn't want to push it with the rain clouds sneaking in overhead. So, we finished our short break and started back down the slippery wash hoping that we would get back out of the wash before it started sprinkling. We used the same up and around for the Obstacle Rock area on the descent. Our speed slowed to a crawl here. We were still dry but one hiker did report a single sprinkle. Finally at the bottom, we climbed out of the wash on the left side and made a short bushwhack over to a nice gravel trail. This old trail led back over to the junction with the Old Mary Jane Falls Trail. The Old Mary Jane Falls Trail was used before the switchbacks were cut. It appears as an old road trail that takes hikers almost straight up to the falls area. 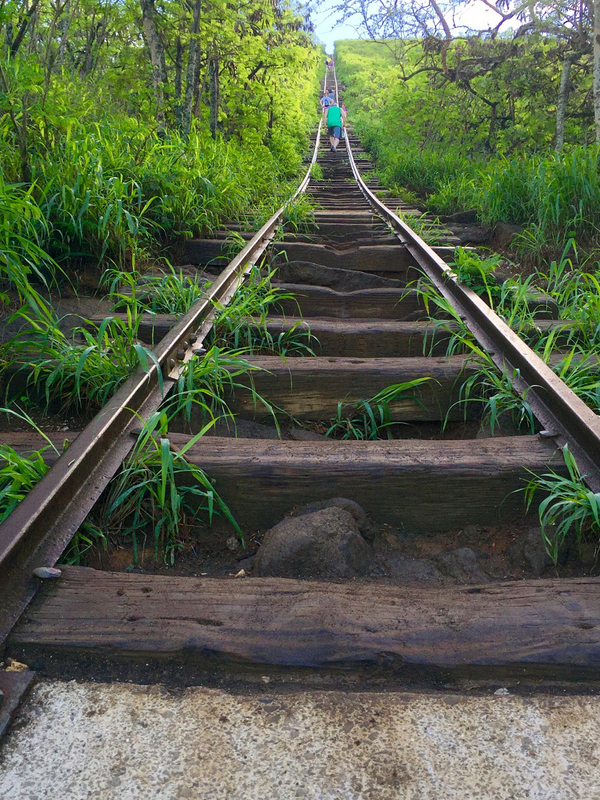 It is steep and, in some places, a little loose. 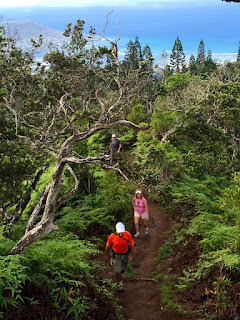 There are fallen trees over the trail in several places. 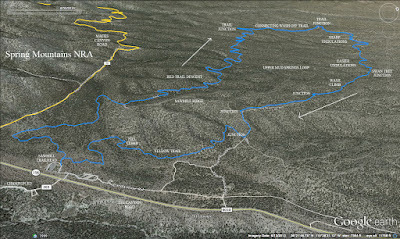 Climbing this trail is quite a workout but affords views of the canyon that cannot be seen from the nearby switchbacks. The final part of the climb includes a relatively flat section and then an even steeper section through some loose scree. Then ... you are there! Right at the base of the falling water. We did not choose to hike over to the cave this time around because, as soon as we sat down on some rocks, it started sprinkling big drops of water. We moved the party over to the rocks underneath the trees where Mr. Chipmunk lives and then the rain stopped. While we sat for our longer break, we started hearing a loud roar that, at first, sounded like a jet engine. The next roar was definitely thunder! 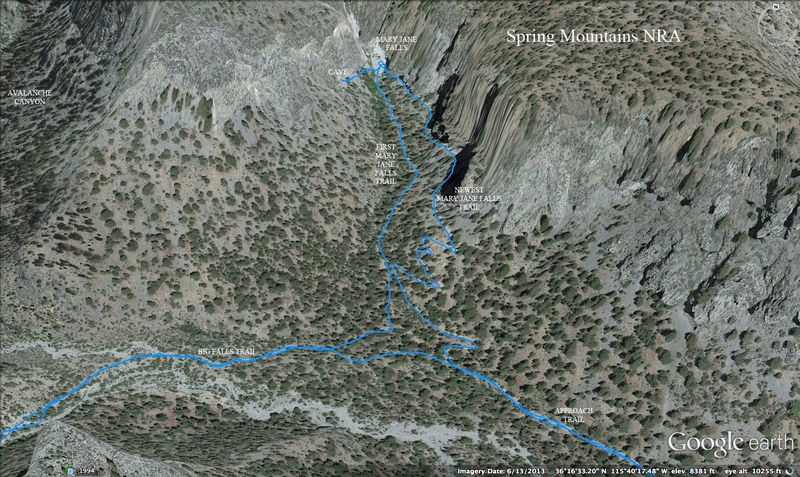 Reluctantly, we gathered ourselves and began descending the switchbacks of the New Mary Jane Falls Trail. Although we never saw lightening, we heard several bouts of thunder as it rolled continuously through the canyon in which we hiked. As we neared the trailhead, the raindrops got bigger and fell closer together. By the time we reached the cars, it was raining hard enough that we needed to hurry. Fantastic morning! Back at the garage, we came in at the same time the other group did. Apparently, they got soaked! Big smiles on everyone!